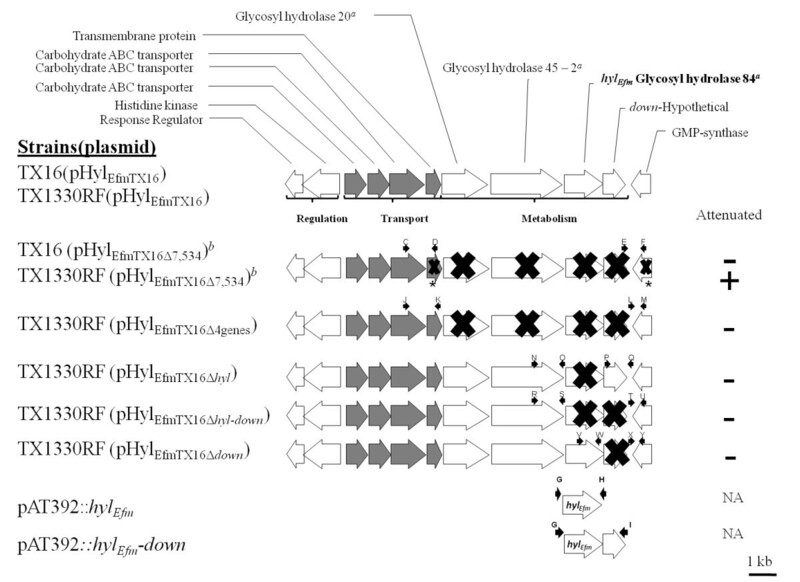 Plasmids containing hyl Efm (pHylEfm) were previously shown to increase gastrointestinal colonization and lethality of Enterococcus faecium in experimental peritonitis. The hyl Efm gene, predicting a glycosyl hydrolase, has been considered as a virulence determinant of hospital-associated E. faecium, although its direct contribution to virulence has not been investigated. Here, we constructed mutants of the hyl Efm -region and we evaluated their effect on virulence using a murine peritonitis model. The four genes of the hyl Efm region (including hyl Efm ) do not mediate the increased virulence conferred by pHylEfmTX16 in murine peritonitis. The use of the markerless counterselection system PheS* should facilitate the genetic manipulation of E. faecium in the future. Enterococcus faecium is a common enterococcal species increasingly isolated from hospital-associated infections in the USA . Compelling evidence suggests that this substantial increase in E. faecium nosocomial infections is due to the worldwide occurrence of a genetic subcluster (designated clonal cluster 17, CC17) which encompasses clones that appear to have evolved independently [2–4]. Several genes have been associated with CC17 E. faecium including i) esp Efm , encoding a surface protein which has been associated with increased biofilm formation and urinary tract infection (UTI) [4–6]; ii) some fms genes (two of which are also designated pilA and pilB), encoding putative microbial surface components recognizing adhesive matrix molecules (MSCRAMMs) or components of enterococcal pili (including the pilus operon ebpABC fm , which appear to play a role in biofilm formation and experimental UTI) [2, 7–10]; iii) an intact acm gene encoding a collagen adhesin which was shown to be important in the pathogenesis of endocarditis  and, iv) plasmids carrying the hyl Efm gene [11–14]. It has been previously shown that hyl Efm is carried by large transferable megaplasmids of different sizes (145 to 375 kb) in hospital-associated E. faecium which are widely distributed worldwide [11–13, 15] These plasmids also can harbour antibiotic resistance determinants and some pilus-encoding genes of E. faecium which are present with hyl Efm in the same plasmid [15, 16]. The acquisition of the hyl Efm -plasmid by an E. faecium laboratory strain (D344SRF) from a US clinical isolate (C68) increased the colonization of the gastrointestinal tract of mice, an effect that was independent of the presence of antibiotic resistance determinants . Moreover, the acquisition of the hyl Efm -plasmid from another US clinical strain (TX16) increased the virulence of a commensal strain E. faecium TX1330RF in experimental peritonitis . The HylEfm protein was initially predicted to have homology with hyaluronidases which have been associated with virulence in other gram-positive pathogens [18, 19], although hyaluronidase activity has not been detected in E. faecium isolates carrying this gene . The most recent annotation and sequence comparisons indicate that this protein is likely to encode a family 84 glycosyl hydrolase [12, 13]. In fact, the homolog of hyl Efm in Streptococcus pyogenes (spy1600) encoded in a genetic locus with a similar organization to that of the hyl Efm -region and sharing 42% identity at the amino acid level (61% similarity), was recently shown not to have any detectable hyaluronidase activity. Spy1600 was characterized as a family 84 glycosyl hydrolase with β-N-acetyl-glucosaminidase specificity after purification and substrate analysis  and expression of spy1600 in S. pyogenes was found to be up-regulated during phagocytosis . For this reason, and because of the almost exclusive occurrence of hyl Efm in isolates from clinical origin in different surveillance studies [14, 22–24], this gene has been postulated as an important pathogenic determinant of hospital-associated E. faecium. However, its exact role in virulence has not been established. In this work, we assess the role of the hyl Efm -region in E. faecium pathogenesis of experimental peritonitis. Table 1 and Figure 1 show the strains and plasmids used in this work and depict the genetic organization of the hyl Efm -region in E. faecium strains and mutants. Derivative of pCJK47 in which the erm(C) gene was replaced by aph-2'-ID and cat was incorporated in the cloning site for allelic replacements; confers Gmr. Physical map of the hyl Efm -region in pHyl EfmTX16 . The annotated predicted function of the corresponding genes is shown above the genes. The genes were divided into three groups (metabolism, transport [in gray] and regulation based on putative functions). Strain nomenclature follows that specified in Table 1. Black arrows above the genes indicate the position of the primers used to obtain DNA fragments for mutagenesis and follow the nomenclature of Table 2. The crosses depict the genes that were deleted. The asterisks indicate only partial deletion of the gene was obtained. a The number refers to the glycosyl hydrolase family with hyl Efm depicted in bold; b allelic replacement with the chloramphenicol acetyl transferase gene (cat) was performed. NA, not applicable. The pheS* system (previously used in Enterococcus faecalis)  is based on the acquired sensitivity of bacteria to p-chloro-phenylalanine (p-Cl-Phe) if they carry a pheS* allele encoding a phenylalanine tRNA synthetase with altered substrate specificity [25, 26]. In order to apply this approach to E. faecium strains, which are commonly macrolide resistant, we constructed a derivative of the pheS* vector pCJK47 by replacing its erm(C) gene with aph2"-ID, which confers resistance to gentamicin. The full aph-2"-ID gene (including promoter and terminator regions) was amplified by PCR using plasmid pTEX5501ts  as the template with primers A and B (Table 2). The amplified fragment (1,089 bp) was digested with NsiI and BglII and ligated with pCJK47 digested with the same enzymes resulting in pHOU1 (Figure 2A). 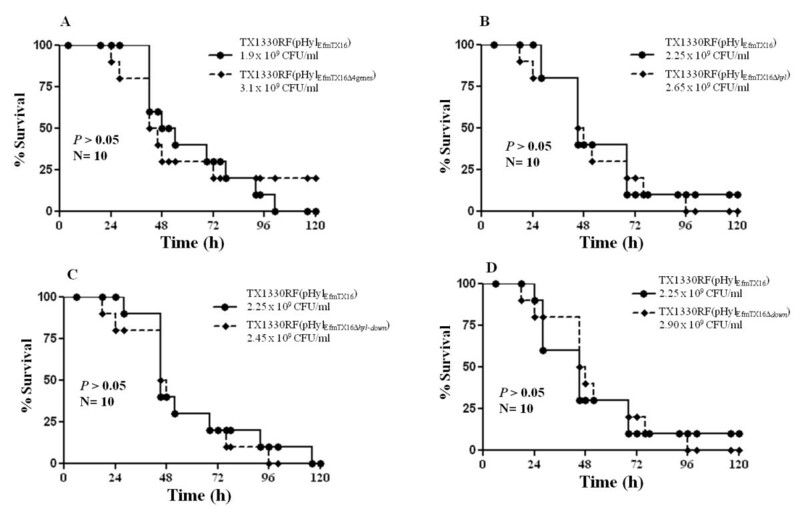 Subsequently, pHOU1 was digested with BamHI and PstI and ligated with a 992 bp fragment released from pTEX5501ts after digestion with the same enzymes and containing the chloramphenicol acetyl-transferase gene (cat), obtaining a 7,906 bp vector designated pHOU2 (Figure 2B). In order to create a deletion mutant of the hyl Efm -region (which contains genes predicted to be involved in carbohydrate metabolism and transport; Figure 1), fragments upstream (977 bp) and downstream (999 bp) of this region were amplified by PCR (with primers C-D and E-F, respectively; Table 2) and cloned upstream and downstream of the cat gene in pHOU2, respectively, using BamHI and XhoI for the upstream fragment and ApaI and EcoRI for the downstream fragment; the correct insert was confirmed by sequencing in both directions. This recombinant plasmid was introduced into E. faecalis CK111 by electroporation as described previously [25, 28] and blue colonies were recovered on brain heart infusion (BHI) agar plates containing gentamicin (125 μg/ml) and X-Gal (200 μg/ml). Subsequently, the pHOU2 derivatives were introduced into strain TX16 by filter mating  with E. faecalis CK111 as the donor. Single cross-over integrants were selected on gentamicin (170 μg/ml) and erythromycin (200 mg/ml) and purified colonies were then resuspended in 50 μl of normal saline and plated on MM9YEG media (salts and yeast extract) supplemented with 7 mM of p-Cl-Phe  and incubated for 48 h at 37°C. To confirm that colonies which grew on MM9YEG media supplemented with p-Cl-Phe were excisants, the corresponding colonies were grown simultaneously on BHI agar in the presence and absence of gentamicin. Colonies that were susceptible to gentamicin were further screened by PCR, pulsed field gel electrophoresis (PFGE) and hybridizations with hyl Efm and cat probes as described before . The mutated region was also sequenced in order to confirm deletion of the corresponding genes. Subsequently, the mutated hyl Efm -containing plasmid (pHylEfmTX16Δ7,534) was transferred from E. faecium TX16 to TX1330RF (a fusidic and rifampin resistant derivative of the commensal strain TX1330, Table 1) by filter mating as described previously  to obtain the strain TX1330RF(pHylEfmTX16Δ7,534). Acquisition of the mutated plasmid by TX1330RF was also confirmed by PFGE, PCR, hybridizations and sequencing. S1 nuclease digestion and PFGE was performed with the mutant to confirm that no other plasmid had transferred during the conjugation event as previously described . The hyl Efm gene was PCR amplified with primers G and H (including the ribosomal binding site and the stop codon of hyl Efm ) (Table 2) using total DNA from TX16 as template, and the DNA fragment (1,685 bp) cloned into the shuttle plasmid pAT392  under the control of the P2 promoter (which allows constitutive expression of the cloned genes) and upstream of the aac(6')-aph(2") gene (which is co-transcribed from the same promoter) using SacI and SmaI sites (plasmid pAT392::hyl Efm ). In order to evaluate if the deletion of hyl Efm had an effect in the downstream gene (encoding a hypothetical protein of 331 amino acids of unknown function), the hyl Efm and down genes (Figure 1) were also cloned together into pAT392 following a similar strategy and using primers G and I (pAT392::hyl Efm -down). Recombinant pAT392-derivatives were purified from E. coli grown on Luria-Bertani agar containing gentamicin (25 μg/ml) and all their DNA inserts sequenced. Subsequently, they were introduced into E. faecium TX1330RF, and the TX1330RF(pHylEfmTX16Δ7,534) mutant by electroporation. Stability of the plasmid constructs was tested by isolating ca. 100 colonies from overnight cultures (using BHI broth) and from the spleens of dead animals (in different experiments) after intraperitoneal inoculation of the corresponding strain (see below) and plating them simultaneously on BHI and BHI-gentamicin (125 μg/ml). To investigate the specific role of the hyl Efm locus in E. faecium pathogenesis, complete in-frame deletions of four genes of the hyl Efm -region, hyl Efm alone, hyl Efm plus its downstream gene and the gene downstream of hyl Efm were generated using TX1330RF(pHylEfmTX16). Fragments upstream and downstream of each region were amplified by PCR with the corresponding primers (Figure 1 and Table 2). These fragments, with overlapping ends, were subsequently amplified by crossover PCR and cloned into pHOU1 using EcoRI and NotI (for hyl Efm , hyl Efm plus its downstream gene and the downstream gene of hyl Efm mutants); and BamHI and PstI (for the four gene mutant). The inserts were sequenced in both directions to confirm that no mutations had been introduced during the cloning process. The recombinant plasmids were electroporated or transferred by conjugation (using E. faecalis CK111) into TX1330RF(pHylEfmTX16). Single crossover events and deletions of targeted regions (Figure 1) were obtained by plating in BHI with gentamicin and p-Cl-Phe containing medium, respectively, as previously described . Confirmation of the deletion was performed by PCR, PFGE, hybridizations and DNA sequencing. RNA was extracted from bacterial cells (TX16, TX1330RF(pHylEfmTX16), TX1330RF and strains containing pAT392 derivatives) grown in BHI broth at 37°C with mild agitation (logarithmic phase of growth, A600 0.8) as described before , and using the RNA isolation kit RNAwiz (Ambion, Austin, TX). RNA was treated twice with DNase (DNase-Free solution, Ambion) and synthesis of cDNA was performed using the commercial kit SuperScript One-Step reverse transcription-PCR (RT-PCR) with Platinum Taq (Invitrogen), according to the manufacturer's instructions. 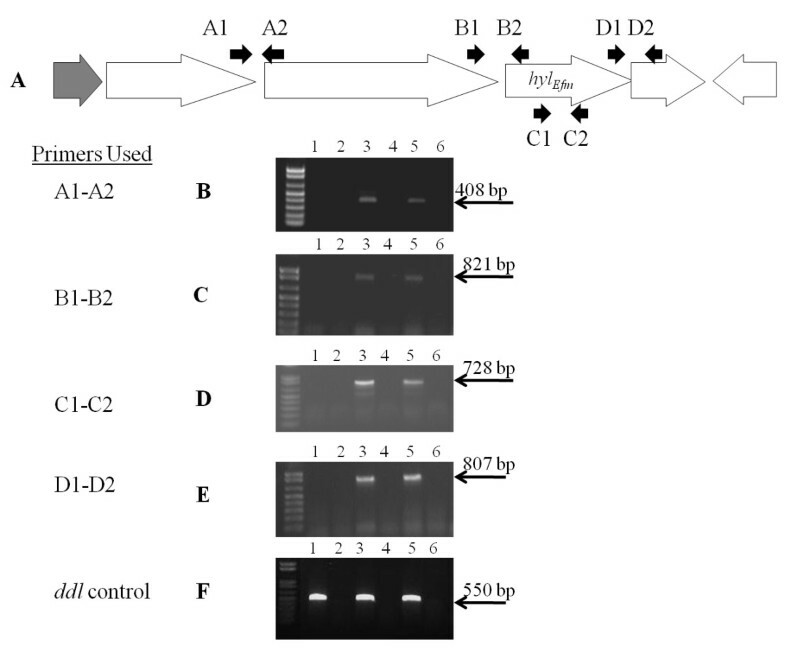 The mixture contained 0.2 μM of each primer, designed to detect overlapping transcripts of the four putative metabolic genes (Figure 3) and an internal transcript of hyl Efm (Table 2). A primer pair directed to detect a 550-bp transcript of the housekeeping gene ddl E. faecium was used as an internal control for RT-PCR experiments [32, 33]. Transcriptional analysis of genes in the hyl Efm region using reverse transcriptase (RT)-PCR. A, physical map of the hyl Efm region and primers used for RT-PCR experiments. Black arrows above the genes indicate the position of the primers used to amplify DNA sequences from the cDNA obtained after reverse transcription. B, RT-PCR using primers A1-A2; C, RT-PCR using primes B1-B2; D, RT-PCR using primers C1-C2; E, RT-PCR using primers D1-D2; F, RT-PCR with ddl as the target gene using primers E1-E2 (Table 2) [32, 33]. Lanes 1 and 2, TX1330RF (RT-PCR reaction and control without RT enzyme, respectively); lanes 3 and 4, TX1330RF(pHylEfm16) (RT-PCR reaction and control without RT enzyme, respectively); lanes 5 and 6 TX16(pHylEfm16) (RT-PCR reaction and control without RT enzyme respectively). The molecular weight of the bands is indicated to the right. Female (4 to 6 week old), outbred ICR mice (Harlan Sprague Dawley, Houston) were used as previously described . Groups of 10 mice per inoculum (ranging from 2.3 × 108 to 3.1 × 109 CFU/ml) were included in each experiment. Inocula for each peritonitis experiment were prepared by growing bacteria initially on BHI agar plates. Subsequently, one colony was grown in BHI broth for 24 h at 37°C and the cells were concentrated in saline (0.9%) to an A600 of ca. 1.2. Strains containing pAT392 and derivatives were handled similarly before the intraperitoneal inoculation, except that the BHI agar and broth contained gentamicin (125 μg/ml). Comparison of the survival curves at similar inocula was performed using a log-rank test with Prism for Windows®. A P < 0.05 was considered significant. All experiments were approved by the Animal Welfare committee, University of Texas Health Science Center at Houston. Since acquisition of the transferable pHylEfmTX16 by TX1330RF conferred increased virulence in experimental peritonitis , we explored the possibility that the hyl Efm region was an important mediator of this effect. Using RT-PCR assays, we were able to detect in vitro expression of hyl Efm during the exponential phase of growth in both TX16 and TX1330RF (pHylEfmTX16) (Figure 3). RT-PCR with primers located at the 3' and 5' ends of contiguous genes yielded products of the expected size in each case, suggesting that these genes are likely to be co-transcribed (Figure 3). Then, we adapted the pheS* counter-selection system  developed for E. faecalis to obtain several deletions of the hyl Efm -region. The hyl Efm gene in E. faecium TX16 (http://www.ncbi.nlm.nih.gov/genomeprj/30627 Genbank accession number ACIY00000000) is located in a cluster of genes whose putative function appears to involve the transport and breakdown of carbohydrates (Figure 1) . As an initial step to test the mutagenesis system, a relatively large deletion (7,534 bp) from pHylEfmTX16 was obtained. The deletion involved three genes predicted to encode glycosyl hydrolases (including hyl Efm ) and a gene downstream of hyl Efm whose function is unknown (Figure 1). Part (226 nucleotides) of a gene encoding a hypothetical transmembrane protein and located upstream of the putative family 20 glycosyl hydrolase gene and part (202 nucleotides) of a gene located 1,332 nt downstream of hyl Efm encoding a putative GMP-synthase and likely transcribed in the opposite direction from the hyl Efm cluster (Figure 1) were also deleted. As it is shown in Figure 4A, the deletion of 7,534 bp in the hyl Efm -region did not affect the virulence of TX16 (DO) in murine peritonitis. Growth and survival curves in the mouse peritonitis model of E. faecium TX0016(pHyl EfmTX16 ) and TX1330RF(pHyl EfmTX16 ), carrying an intact hyl Efm -region, and pHyl EfmTX16Δ7,534 (6 gene mutant of the hyl Efm -region). 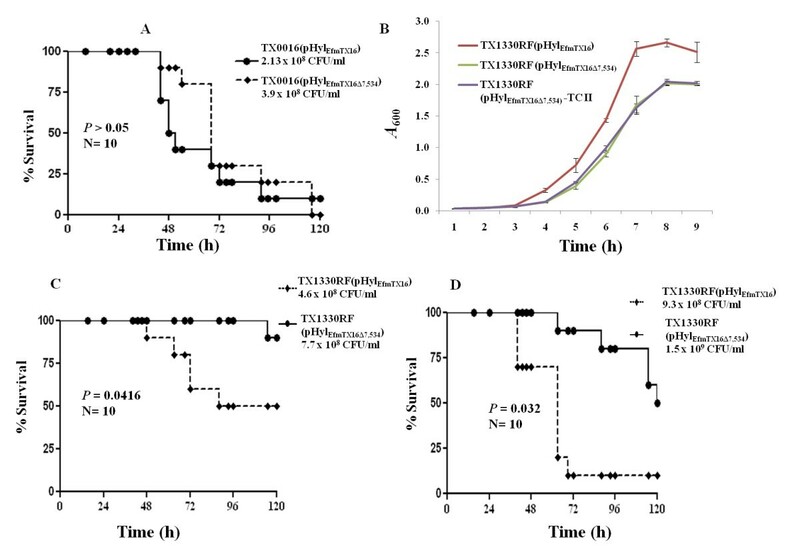 A, Survival curve of representative inoculum (5 inocula per experiment in two independent experiments) of TX0016(pHylEfmTX16) vs TX0016(pHylEfmTX16Δ7,534) in mouse peritonitis; B, growth curves of TX1330RF(pHylEfmTX16) vs TX1330RF(pHylEfmTX16Δ7,534) and a second transconjugant [TX1330RF(pHylEfmTX16Δ7,534)-TCII] obtained from the same mating experiment between TX16(pHylEfmTX16Δ7,534) and TX1330RF, expressed as optical density (A600) in brain heart infusion (BHI) broth (results of at least three experiments per strain). C and D, survival curves of TX1330RF(pHylEfmTX16) vs TX1330RF(pHylEfmTX16Δ7,534) obtained in the peritonitis model at different inocula in independent experiments performed at different days. Next, we considered the possibility that an in vivo effect might be more clearly dissected if studies were performed in the background of a non-clinical strain. We hypothesized that an in vivo effect of a virulence determinant might more likely be seen in strains which are less successful clinically; that is, that a commensal strain such as TX1330RF  is likely to have decreased fitness or ability to produce disease compared to TX16  and, thus, acquisition plus subsequent loss of a virulence determinant that alters such fitness would be easier to identify . Thus, the mutated plasmid from strain TX16(pHylEfmTX16Δ7,534) was transferred to TX1330RF by conjugation and the in vivo effect of acquiring the intact plasmid  vs the plasmid carrying the deletion was evaluated. The two strains [TX1330RF(pHylEfmTX16) and TX1330RF(pHylEfmTX16Δ7,534)] appeared to differ only in the size of the hyl Efm plasmid by PFGE and S1 nuclease assays  (not shown). Figure 4B shows that deletion of 7,534 bp in the hyl Efm region of TX1330RF(pHylEfmTX16) caused an in vitro growth defect. The alteration of growth was also seen in a second transconjugant from the same mating experiment between TX16(pHylEfmTX16Δ7,534) and TX1330RF (TC-II in Figure 4B). The mutant strain TX1330RF(pHylEfmTX16Δ7,534) was attenuated in the mouse model of peritonitis (even when an increased intraperitoneal inoculum for the mutant were used) (Figure 4C and 4D) (P < 0.05). Due to the alterations produced in the growth of TX1330RF(pHylEfmTX16Δ7,534), these results suggest that the attenuation in virulence may have also been due to factors other than those specifically related to virulence. In order to further evaluate if the attenuation observed in TX1330RF(pHylEfmTX16Δ7,534) (as described above) was mediated by a direct effect of hyl Efm in the peritonitis model, we explored complementation of this mutant in trans with the full hyl Efm gene and a combination of hyl Efm and the downstream gene using the shuttle vector pAT392 . The cloning strategy placed these genes upstream of the aac(6')-aph(2") gene (which confers resistance to gentamicin) resulting in all open reading frames under the control of the constitutive P2 promoter. Up to 80% loss was observed with all strains in the absence of gentamicin; however, in the presence of the antibiotic during inoculum preparation, the TX1330RF(pHylEfmTX16Δ7,534)-derivatives containing the pAT392 constructs were stable both in vitro and in vivo (5% maximum percentage of plasmid loss). 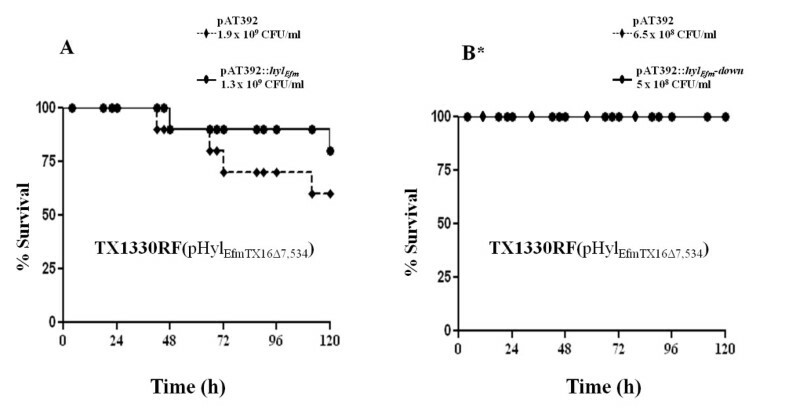 Introduction of hyl Efm or a combination of hyl Efm plus its downstream gene (cloned into pAT392) did not restore the virulence of the mutant strain TX1330RF(pHylEfmTX16Δ7,534), compared to pAT392 alone in the presence of gentamicin (Figure 5A and 5B). The results indicate that constitutive expression of hyl Efm alone or in combination with its downstream gene (which was confirmed by RT-PCR, not shown) was not able to restore the phenotypic differences observed in the mutant strain TX1330RF(pHylEfmTX16Δ7,534), supporting the fact that hyl Efm may not be directly responsible of the attenuation observed in the mutant. Survival curves in the mouse peritonitis model of E. faecium TX1330RF and derivatives. A and B show survival curves of the TX1330RF(pHylEfmTX16Δ7,534) (6 gene mutant in the hyl Efm region) complemented with pAT392-derivatives (which include pAT392::hyl Efm and pAT392::hyl Efm -down) obtained in the peritonitis model at different inocula in independent experiments performed at different days. The asterisk indicates that the lines are superimposed since values are identical. Under our experimental conditions, we cannot completely rule out that the in vivo attenuation observed with pHylEfmTX16Δ7,534 in the TX1330RF background may have been caused by the partial deletion of the hypothetical transmembrane protein or the putative GMP-synthase located upstream and downstream of the hyl Efm -cluster, respectively. Indeed, a deletion of 76 amino acids in the C-terminus of the hypothetical membrane protein occurred in this plasmid, resulting in the deletion of three predicted transmembrane helices. Similarly, 68 amino acids in the C-terminus of the putative GMP-synthase were deleted; the removal of these amino acids is likely to disturb the dimerization domain of this protein  affecting its function in nucleotide metabolism. Moreover, a second TX1330RF(pHylEfmTX16Δ7,534) mutant also exhibited an almost identical growth defect (Figure 4B). Thus, it is tempting to speculate that changes in these two genes may have affected the "metabolic" fitness of the TX1330RF(pHylEfmTX16Δ7,534) strain. However, since no evident change in fitness or virulence was observed with the mutated plasmid in the TX16 background, another possibility is that an extraneous change elsewhere in the plasmid (or chromosome) occurred during the conjugation process that influenced the in vitro growth of the TX1330RF(pHylEfmTX16Δ7,534) mutant(s) and its virulence. In order to dissect further the in vivo role of hyl Efm and the adjacent genes, we produced several in-frame deletions of these genes (Figure 1) including: i) a four gene mutant of the hyl Efm -region (including hyl Efm ) [TX1330RF(pHylEfmTX16Δ4genes)], ii) a deletion of hyl Efm alone [TX1330RF (pHylEfmTX16Δ hyl )], iii) a deletion of hyl Efm plus its downstream gene mutant [TX1330RF (pHylEfmTX16Δ hyl-down )] and, iv) a single deletion of the gene located downstream from hyl Efm [TX1330RF (pHylEfmTX16Δ down )]. The mutagenesis strategy removed the open reading frame from the start codon of the first gene to the stop codon of the last gene (in case of multiple genes). In case of single gene deletion, the complete ORF (start to stop codon) was removed, leaving the surrounding DNA intact as in the wild type plasmid. None of the four mutants of the hyl Efm -region showed a deleterious effect in the growth kinetics compared to TX1330RF (pHylEfmTX16) (harbouring an intact plasmid, Additional file 1). Moreover, we were unable to observe any attenuation of virulence in the mouse peritonitis model compared to the parental strain with the intact plasmid (Figure 6A-D), which further supports the fact that the four genes of the hyl Efm region do not appear to be directly involved in increasing the pathogenic potential of pHylEfmTX16 in strain TX1330RF(pHylEfmTX16). Megaplasmids (>145 kb, with or without hyl Efm ) have been recently found to be widespread among clinical isolates of E. faecium worldwide [12, 13, 15]. The proportion of these plasmids carrying hyl Efm appears to vary according to geographical location (ca. 11 to 36%) [12, 13]. Our findings indicate that the four genes of the hyl Efm -cluster studied here, including hyl Efm are not the main mediators of the virulence effect conferred by the plasmid carrying them in experimental peritonitis. Since the pHylEfm plasmids are large, it is presumed that other genes (i.e., upstream or downstream of the glycoside hydrolase-encoding genes) are more relevant in mediating this effect. Additionally, we cannot exclude that the hyl Efm cluster studied in this work may play a role in other infections such as endocarditis or urinary tract infections (a subject of our ongoing studies). As a final remark, the adaptation of the pheS* counter-selection system for targeted mutagenesis in plasmid and chromosomal genes of E. faecium will facilitate the understanding of the role of other specific plasmid genes in the pathogenesis of E. faecium infections in the near future. We provided evidence that four genes of the hyl Efm -region (including hyl Efm ) do not mediate the virulence effect of the E. faecium plasmid pHylEfm in experimental peritonitis. The adaptation of the PheS* counter-selection system for targeted mutagenesis of E. faecium should facilitate the study of the role of other pHylEfm genes in the pathogenesis of murine peritonitis. CAA is supported by NIH Pathway to independence award R00 AI72961 from the National Institute of Allergy and Infectious Diseases (NIAID). This work was also supported in part by NIH grant R56 AI042399 and R01 AI067861 (to BEM) and R01 grant AI045626 (to LBR) from the NIAID. DP was partially funded by a graduate scholarship from The Instituto Colombiano para el Desarrollo de la Ciencia y Tecnología, "Francisco José de Caldas", COLCIENCIAS. SR was supported by an ASM-PAHO Infectious Disease Epidemiology and Surveillance Fellowship. We are grateful to Patrice Courvalin and Gary Dunny for providing plasmids pAT392 and pCJK47, respectively, and Pontificia Universidad Javeriana, (Bogotá, Colombia) for logistic support. We are grateful to Shreedhar Nallapareddy for useful discussions and experimental advice. DP carried out molecular genetics studies, animal experiments and participated in editing the manuscript. MCM, SR and MFM performed molecular genetics experiments. KVS carried out part of the animal work. BEM and LBR participated in editing the manuscript and data analysis. CAA is the principal investigator, conceived the study, designed the experiments, performed data analysis and wrote the manuscript. All authors read and approved the final version of the manuscript.